Check out the latestMedical Minded Podcast episode, Gram Staining: Gram-Negative vs Gram-Positive Bacteria which covers what gram staining is, how it works and how it is used to differentiate gram-negative and gram-positive bacteria. This is a must know for anything who is a med student, premed or even just taking a biology course. I know this episode may be basic for some people, but it’s essential information and it’s always good to work on the fundamentals! Check out the latest episode of the Medical Minded Podcast that provides an introduction to heart sounds! Also, please leave a review and/or submit any suggestions for future episodes. Thanks! A new episode covering medulloblastoma is now available! As I’ve said before, it usually takes a few days for iTunes to update, but feel free to use the link below! Also, any ratings and/or reviews in the iTunes store would be greatly appreciated! A new episode of Medical Minded podcast covering hypertension is now available! It seems like it takes a couple days for it to become available on iTunes, but if you’d like to view it now, check out the link below. You can left-click to listen through your browser or right-click to save the file to your computer. Remember, feedback is always appreciated! Thanks! 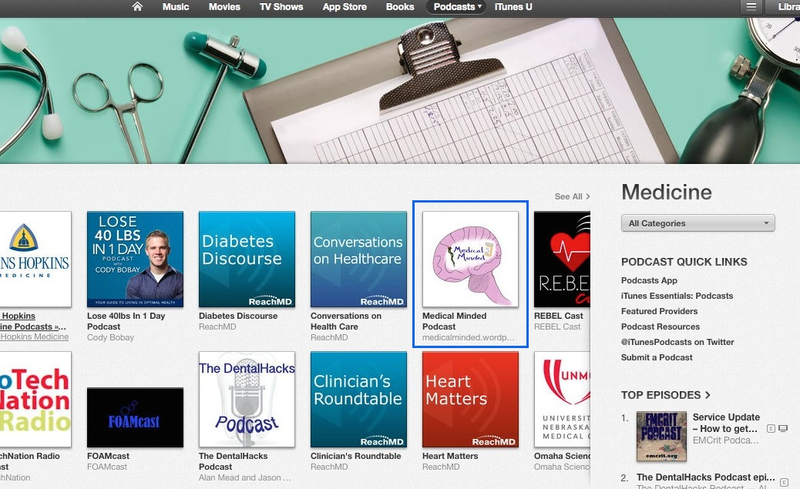 Medical Minded is “New & Noteworthy” on iTunes! Please share the podcast with friends and I would love some feedback and/or reviews through the blog or on iTunes! The more reviews I get on iTunes, the more people will see the podcast. Also, please let me know of any topics you’d like to be covered. Thanks for everyone who has listened to the first couple episodes! A new podcast episode has been posted that covers tetanus and botulism. Also, I reworked the podcast artwork and came up with the image shown above. Please check out the podcast and let me know what you think! The Medical Minded Podcast is official! I encourage everyone to visit here or go to the iTunes store and a quick search should should allow you to find it. The iTunes artwork isn’t currently working, but I’ve made adjustments so hopefully it gets updated in the next few days. The current “test” podcast is over the pathogenic Bacillus species of bacteria and I intend to continue making more educational-based podcasts. However, if anyone has suggestions for subject matter they’d like to be covered just let me know! I’d really like some input! This applies to premeds, med students or anyone else! It can be over educational material, writing essays, application processes, research or anything else you can think of. Hopefully I’ll know the answer and if not, I will do my best to come up with an answer! Comments, suggestions, and questions are highly welcomed and encouraged! Medical Minded Podcast Coming Soon! Medical Minded Podcast is currently in the works and I’ve already recorded a few episodes. Pending iTunes approval, we will be up and running so stay tuned!